On Tuesday, Sept. 11, 2001, when the shocking events in New York and Washington were first unfolding, I strongly felt that what we needed was a hero. I suppose that I felt a childish need to cling to the comforting idea that someone was going to come and make it all better. Then I thought that it should be possible to magickally create that hero: a thought-form, or egregor, that could act as a sort of guiding spirit for our country, and the world at large; One that could act with the precise fierceness of a warrior, but from a space of compassion. I thought that if I could use symbols that our culture had already produced and bonded with, then it would have even more power and be easier to “spread” the energies into the world-at-large. In magick, symbols are powerful things. If principles and powers can be brought together under the symbol of a personifying force, then that symbol becomes a “focal-point” of psychic energy and can then take on a life of it’s own. We “feed” the image with our power, and our prayers, and it in turn grows strong, enough perhaps to accomplish what may seem to some an impossible task. In the days that would follow the attack, the people of this country would come together under a symbol that seemed to reappear out of nowhere. Suddenly omnipresent, the American flag seemed to sooth some peoples fears, and remind us that no matter where in our country the attacks were made, we were all together in this; we were all Americans. We flew one at work. I wore one when I went outside in public. Under this banner, the people were united once more. In the realm of the symbolic, the flag holds a great deal of power. It has been said that it is perhaps the only symbol that is common to each and every one of us in this nation of diverse peoples and cultures. Even if we don’t agree with everything that the government represented by it engages in, it reminds us of those principles that the flag is supposed to stand for, and in this way unites us with the very serious purpose of creating them in truth. I can disagree with my government, even hate it at times, but I love my country. I love what it is supposed to represent; what it aspires to. Right now the flag, to me, is a symbol of that aspiration. It reminds me of what we are supposed to reach for. There are certain limitations to the flag, however. It is particularly limiting in terms of national boundaries, which can prove to be a crippling problem when what is called for is an international response. Some might argue that the flag stands for the principles of freedom and justice, but how many times have we seen it used as an agent of war and arrogance? The flag is many things, to many people. Many conflicting powers and associations are woven into its Stars and Stripes. But behind the symbols and policies lies the philosophy, which must always be the foundation of a free people. The idea of freedom and justice for all remains our guiding star. Again we are called upon to make the dream a reality. Even if we do not feel touched by the negative associations that can accompany the flag, it lacks a “personality” that I feel is necessary when dealing with the formation of an egregor. Because of this lack of focus, the solitary flag didn’t feel like an adequate symbol to ‘contain’ the essence of the thought-form. I felt that what was needed was an intelligent force… one that could make decisions based on changing information and events… events that I myself would not be privy to. And also a force that would be guided by those principles that perhaps I can aspire to, but do not always attain. I have human failings, and so I cannot claim to know what specific actions to take in order to achieve the best outcome for other than myself. In this I was appealing to a higher power. What was needed was a personification of those guiding principles… an archetype from which to draw from… a myth from which to begin. Working from the standpoint of modern pagan witchcraft, I am inclined to think in terms of the Goddess. If ever Her presence were needed it is in those times that are touched by war. Knowing how potent common symbols are when applied to an entire culture, I was not surprised to hear it suggested that I consider working with the Goddess of Liberty, Her devotional image being that of the statue that we all know so well. I would later do exactly that, in conjunction with my main working. An important thing to consider when choosing a symbol for magickal working, is your “inspiration level”. Symbols work best when they speak to the fetch; to those deepest parts of our selves. Many times this is a result of events and images that we were exposed to as children. Myths and other inspirational liturgies were passed down in traditional cultures by storytelling and ritual enactment, thus allowing their collective momentum to grow with each passing generation, with each new telling. Lacking specific avenues for the transmission of spiritual instruction in modern society, magick, as it always does, took the path of least resistance. The powers of myth have endured in our society, flourishing in the stories that inspire and delight us. Books, television, movies… newer methods of transmitting symbolic power to the masses, and none the worse for wear. I had been inspired by the power of my chosen symbol long, long ago. In use for years, seen my millions, recognized anywhere in the country, admired by me since childhood. She (because only a female could be called on to successfully battle the forces of the patriarchy) has stood for truth, for compassion, for justice, for everything that America hopes to strive for, even if it doesn’t always succeed. She has been a consistent presence in our culture since Her first appearance in WWII. 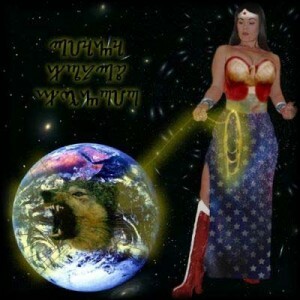 Her image can be seen on glasses, mugs, t-shirts, posters, computer games, television shows, magazines, books, toys, and everything else you can possibly imagine. Seen by little girls (and boys) for over sixty years, Her essence growing with every new admirer, She has stood for the ways of the Goddess since the beginning. She is action without ego… strength married to compassion… Fierceness married to healing… She is a warrior, but also a scholar, healer, priestess. She is the Great American Goddess. She’s even dressed in our flag. She is Diana, Princess of Themyscira, Ambassador of Paradise, Goddess of Truth, Avatar of Olympus, Emissary of the Glory of Gaea, better known to the world as Wonder Woman. Perhaps some will find the idea odd, strange, or even ridiculous that I would suggest spiritually connecting to a comic-book character, but She called to me to perform this work. A month prior to these workings I was inspired to write of Her as a modern Goddess. I felt Her as a very real Goddess power communicating from the world beyond, clothed in a symbol created by our own modern culture. The real beauty is that I didn’t have to create anything… the power was already there in the form of archetype and modern myth. I just had to tap-into it. It was She who perhaps first inspired me in my childhood to seek out the Old Gods… (“Great Hera, give me strength!”) As a child my admiration for Her was strong, perhaps due to Her being representative of a type of strength and power that is not aligned to traditional male-dominance, and thus in short supply. Hers was the power of love and the magic of compassion… Those were powerful and inspiring qualities for a little queer boy back in the early 1970’s. In recent times I have re-connected more deeply with Her, although these workings that I have performed in connection with this issue are the first that I have done. I have always seen Her as a modern version of the ancient Roman huntress/moon-goddess Diana, although tailored into Her modern guise. I lit candles around an image of Her and asked that Her spirit and Her principles flow over our country and into the heads and hearts of our leaders, and those beyond our shores. Let all that bear Her likeness be conduits for Her power, like fountains gushing forth those principles that She represents. Let all who see Her image be touched by Her power. I am asking Her to bring tolerance and understanding to those who would otherwise wage violence on those who’s ways are different and are of darker skin. 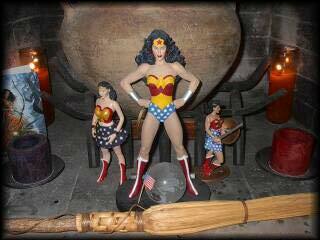 I am asking Her to bind events and leaders in her lasso of truth, that none may be deceived into wrongdoing. I am asking her to use Her bracelets to deflect further attacks that may be on the horizon, and render them harmless. I am asking Her to use Her powers to teach us about the very thing that She was sent to teach Man’s World in the very beginning: how to live with one another in peace. With the swiftness of Mercury, the strength of Hercules, the wisdom of Athena, and the beauty of Aphrodite, may She come to protect and inspire us all. This is what I pray for these days. It’s a pretty lofty goal but then magick is a pretty lofty thing, isn’t it? To some it might sound absurd… but it really means something to me. Those principles mean something to me. America means something to me.